Publisher: Arihant Publications PVT LTD. Bachelor of Laws or LLB is a professional Under-graduate degree in law that enables one to become lawyer. Students seeking admission in this programme must clear the entrance examination. 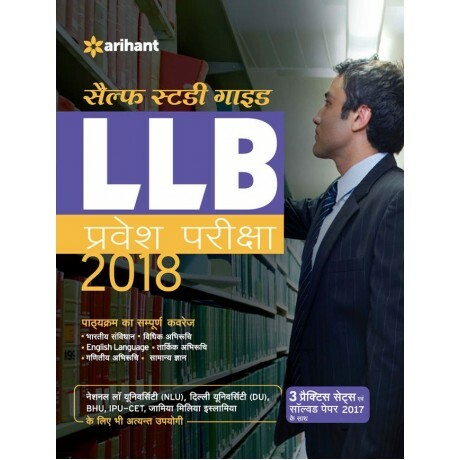 Self- Study Guide for LLB has been designed specifically for the aspirants appearing for the Bachelor of Laws Entrance Examination. With complete coverage of syllabus book has been provided with exam notifications, paper pattern and instructions on how to attempt questions in the exam. All the questions included in the book are framed exactly based on the Latest Examination Pattern with the aim to take the aspirants towards accomplishing the goal. A well explained and detailed solution of Solved Paper 2017 and 3 Practice Sets not only gives an idea about self evaluations but it also guarantees to get through, National Law University, Delhi University, Banaras Hindu University, IPU-CET, Jamia Millia Islamiam, etc. "Bachelor of Laws or LLB is a professional Under-graduate degree in law that enables one to become lawyer. Students seeking admission in this programme must clear the entrance examination. Self- Study Guide for LLB has been designed specifically for the aspirants appearing for the Bachelor of Laws Entrance Examination. With complete coverage of syllabus book has been provided with exam notifications, paper pattern and instructions on how to attempt questions in the exam. All the questions included in the book are framed exactly based on the Latest Examination Pattern with the aim to take the aspirants towards accomplishing the goal. A well explained and detailed solution of Solved Paper 2017 and 3 Practice Sets not only gives an idea about self evaluations but it also guarantees to get through, National Law University, Delhi University, Banaras Hindu University, IPU-CET, Jamia Millia Islamiam, etc. " Contents1. Legal Awareness2. Legal Reasoning3. Mock Tests..
SpecificationBook DetailPublication Year1987ISBN-13978-81-7409-274-8ISBN-1081-7409-274-8LanguageEnglishEdition32ndNumber of Pages1238PrefaceThe author feels great pleasure in presenting a thoroughly r.. This comprehensive analysis of Indian society brings together the results of modern social research to trace the patterns that underlie social relations throughout India. Society in India vi..
OverviewFeaturesTable of ContentsWe bring to you a series of books for effective preparation of Civil Services Examinations. These books are written following a powerful pedagogy and are developed wit..
CONTENTPreface to the Eighteenth Edition Best Law Schools of India Family of Law. University of Delhi Del hi University LL.B. Entrance Exam 2017 the Original Question Paper Del hi .. The third comprehensively revised edition of Study Package for CLAT and LLB Entrance Examination will be an invaluable asset for aspirants preparing for this prestigious law entrance examination..
About the BookFaculty of Education, Delhi University conducts an entrance test for admission to Bachelor of Education (B.Ed.) Course in one of the finest institutions of professional learning and rese..
About the BookGuru Gobind Singh Indra Prashtha University (GGSIPU), Delhi organizes Common Entrance Test to provide admission to Bachelor of Education programme in various colleges. The programme aims..